Get the same state-specific property management forms that a lawyer would give you. You are viewing all documents for the state of Alabama. To view documents for a different state, select the state from the drop down above. 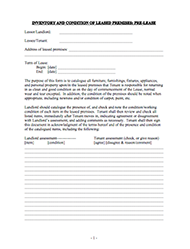 This Residential Rental Lease Application form is a Residential Lease Application for the Landlord to have the proposed Tenant complete and submit to the Landlord for the Landlord to evaluate. It contains required disclosures and an authorization for release of information. All available formats listed above are immediately available for download after checkout. This is a sample preview only. The document specific to your state may vary. 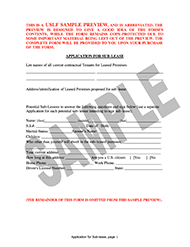 This Salary Verification form for Potential Lease is a form to be sent to a potential tenant's employer, in order for the Landlord to verify the lease applicant's income as reported on an application for lease (please see Form -827LT "Application for Residential Lease"). 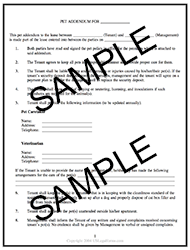 A Tenant Consent Form comes with the Salary Verification Form, and should also be sent to the employer. 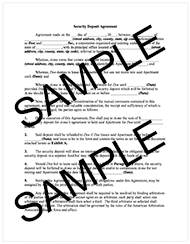 This is a consent form to be signed by Tenant, permitting a credit history, background and reference check to be performed by the Landlord. A criminal history background information check is the review of any and all records containing any information collected and stored in the criminal record repository of the Federal Bureau of Investigation, the state Department of Public Safety, or any other repository of criminal history records, involving a pending arrest or conviction by a criminal justice agency, including, but not limited to, child abuse crime information, conviction record information, fingerprint cards, correctional induction and release information, identifiable descriptions and notations of convictions; provided, however, dissemination of such information is not forbidden by order of any court of competent jurisdiction or by federal law. Criminal history background information generally does not include any analytical records or investigative reports that contain criminal intelligence information or criminal investigation information. 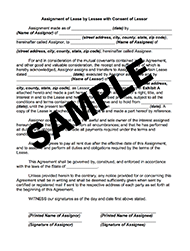 This is a Residential Rental Lease Agreement form for use in your State. This lease is designed for a specific term such as 1 or more years, 6 months, etc. It contains many provisions, some of which you may desire to modify depending on your agreement with your tenant. You should use this form as a guide and modify it to suit your needs. 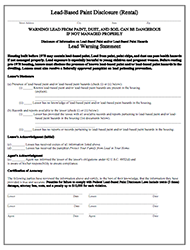 This is a Lead-Based Paint Disclosure form required for the rental of residential dwellings. 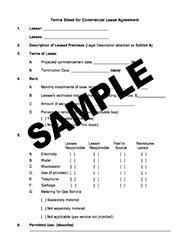 If the rental unit was constructed PRIOR TO 1978, this form is REQUIRED to be completed and signed by the lessor/landlord and lessee/tenant. If the rental dwelling was constructed in 1978 or later, this form is not required. If in doubt about the timing of construction, use the disclosure form. Whenever the form is used, the landlord must also give the tenant the EPA pamphlet discussed below. This Inventory and Condition of Leased Premises for Pre Lease and Post Lease is an inventory signed by a Tenant of rental property that attests the condition of leased premises pre-lease and post-lease. It includes lists of all furniture, furnishings, fixtures, appliances and personal property upon/in the leased premises. An assessment of the condition of each item is written by Landlord and the Tenant may agree or disagree to that assessment. This is a Landlord Tenant Closing Statement - Reconcile Security Deposit, where the landlord records the deposits and credits, less deductions from the credits or security deposit for delivery to the tenant. It is used to document for the benefit of both parties the monies held by the landlord and due to the landlord. A security deposit is a payment required by a landlord from a tenant to cover the expenses of any repairs of damages to the premises greater than normal "wear and tear." Everyday usage is normal wear and tear, but excess damage is a debated definition. A security deposit is not the same as rent. It is money that actually belongs to the tenant but is held by the landlord for tenant-caused damages and sometimes past-due rent. Without the agreement of the landlord, a security deposit may not legally be used as the last month's rent. Laws vary by state, but some states place a limit on the amount of a security deposit that a landlord may charge. Some states also regulate where residential security deposits must be kept and when interest payments on the security deposits must be made to the tenant. State laws also define the time period after the tenant vacates within which the deposit must be returned to the tenant. 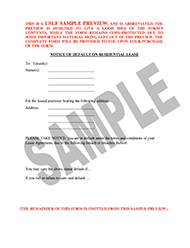 This Notice of Default in Payment of Rent as Warning Prior to Demand to Pay or Terminate for Non-Residential or Commercial Property form is for use by a Landlord to inform Tenant of Tenant's default in the payment of rent as a warning prior to a pay or terminate notice. The form advises the Tenant of the due date of rent and the consequences of late payment. 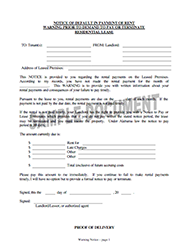 This form may be used where you desire to remind the Tenant of payment terms, the default, demand payment and inform the Tenant that under the laws of this state or lease the Landlord may terminate in rent is not paid timely. Notice of Default on Residential Lease with Specific Reasons for Default, with Deadline Date to Cure. This notice is pursuant to applicable law. Should Tenant fail or refuse to cure the default as outlined, Landlord may issue a Notice of Termination of Lease Agreement and evict Tenant, and/or take such other action as allowed by law. This is an agreement for the renewal of an existing lease for an additional term, with possible modifications. The agreement terms conform to state statutory law.This agreement is for the renewal of a non-commercial or residential lease. Agreement to extend the term of a residential lease, with possible modifications. 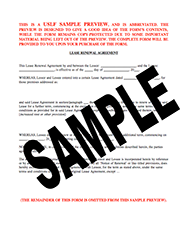 Landlord and Tenant extend and continue the term and duration of the described Lease Agreement. Lessee(s) will continue to be joint and severally liable. A lease extension is used to extend the terms of a previous lease between the landlord and tenant. 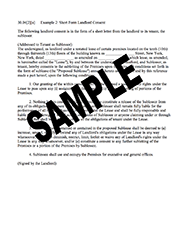 By signing the extension, it is not necessary for the parties to execute a new lease. Generally, all terms of the previous lease are carried over by reference in the extension. Usually, the extension simply extends the term of the prior lease and may contain provisions for a revised rent payment. 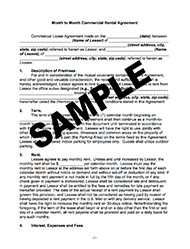 This form is a comprehensive month-to-month lease agreement wherein either Landlord or Tenant may typically give one monthâ€™s notice to vacate the premises for any reason or no reason at all. Otherwise, the lease simply continues from month to month as long as rent is paid and the lease is not breached. This differs from a â€oetermâ€ lease for a specific time such as 1 year, 6 months, etc, after which â€oetermâ€ the lease ends or may be renewed. During the lease term, the Tenant may only be evicted for cause (not paying the rent, breaching the lease, etc), and the Tenant is responsible for the entire amount of rent for the lease term, even if Tenant leaves early. Apartment lease addendum concerning the keeping of pets in the complex units. 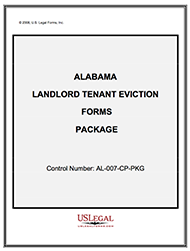 Updated for the 2006 Alabama Residential Landlord & Tenant Act. 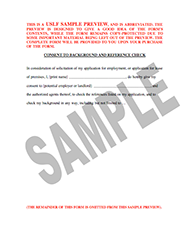 This 7 Day Notice to Pay Rent or Lease Terminates form is used by a Landlord to demand payment of overdue rent from a residential tenant within 7 days from giving the Notice, in accordance with the laws of your state. (Note: If a written agreement provides for a longer notice, use the notice length stated in the agreement). "Residential" includes a house, apartment or condo. If the Tenant fails to pay within 7 days, the lease may be considered terminated by the Landlord. The Tenant is informed that the Tenant must either pay the rent or suffer termination and be moved out by the deadline. If he does not pay and fails to move out, the Landlord may begin eviction proceedings. If the Landlord does not elect to proceed with termination or eviction, but instead agrees to accept rent after the termination date stated in the Notice, the lease is generally reinstated. 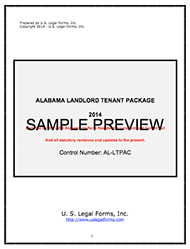 Updated for the 2006 Alabama Residential Landlord & Tenant Act. This 14 Day Notice to Tenant to Remedy Breach or Lease Terminates is used by Landlord to give a residential Tenant notice of Tenant's breach of the lease agreement, for a breach other than non-payment of rent. "Residential" includes apartments, houses, and condos. The form identifies the specific breach and directs the Tenant to remedy the breach within 14 days. The Tenant is informed that his failure to remedy the breach before the deadline may result in Landlord terminating the lease. This is a tenant welcome letter. This welcome letter is a compilation of information given to a new tenant providing contact info for utilities and reminders relevant to the lease agreement. 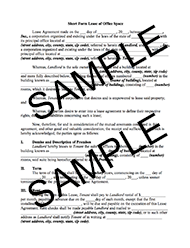 Residential Rental Lease Forms and Agreements Package. 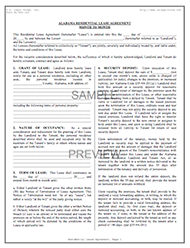 This Landlord/ Tenant package contains select forms for the Alaska Landlord Tenant Relationship including the (1) Application, (2) Lease, (3) Lead Paint Disclosure, (4) Other Disclosures, if applicable, (5) Termination Notice for Non-Payment of Rent, (6) Pre and Post Inventory Report, (7) Salary Verification Form, (8) Tenant Welcome Letter and (9) Landlord Tenant Closing Statement. 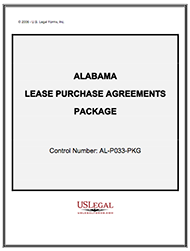 This is a commercial lease form for the State of Alabama. It is for leasing a building for any use, such as an office. This lease is very detailed and includes provisions addressing the areas of lease term, payment of rent, later charges, utilities, condition of premises, security deposits, default, termination, right of re-entry, holdover, and many other legal clauses. Make changes to suit your needs and agreement with your lessee. 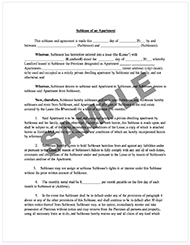 This form is a sample of an agreement between a potential tenant and owner/landlord to lease a certain apartment from the owner at a future date. The consideration for holding the apartment (e.g., not renting it) is the deposit of a sum of money with the owner. The tenant will forfeit the entire sum if he fails to lease said apartment on or before a certain date. 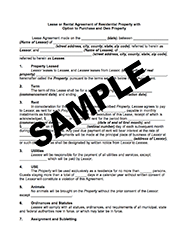 This form is a sample of a commercial lease of real property which contains an option to purchase the property at the end of the term. This lease is a triple net lease which means that the lessee pays, in addition to rent, all expenses associated with the property such as property taxes, insurance and maintenance and operation charges. Triple net leases are commonly used in commercial properties, such as shopping malls and apartment buildings. 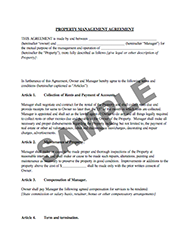 This Property Manager Agreement is an employment contract. A Property Manager Agreement is a contract containing terms and conditions of employment of property manager by owner of rental property. This form is compliant with state statutory law. 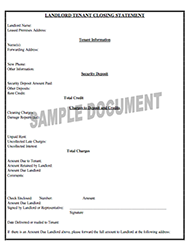 This is a lease with an option to purchase the premises described in the form. The parties acknowledge that speculation of availability of financing, purchase costs, and lender's prepayment penalties is impossible. Therefore, the parties agree that these items will not be conditions of performance of this Agreement and the parties agree they have not relied upon any other representations or warranties by brokers, sellers, or other parties. This Property Management Package contains the essential forms to assist you in leasing your premises, complying with legal requirements, and keeping relations with your tenants amicable. State-specific forms are included. This is an amended lease for an office building. 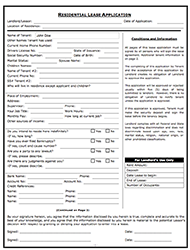 This form is a generic example that may be referred to when preparing such a form for your particular state. It is for illustrative purposes only. Local laws should be consulted to determine any specific requirements for such a form in a particular jurisdiction. A modification is written change made to a contract. It may be unilateral in accordance with the changes clause in the contract or bilateral. A modification may introduce or cancel specifications or terms of a contract without effecting the purpose of the contract. This form is a generic example that may be referred to when preparing such a form for your particular state. It is for illustrative purposes only. Local laws should be consulted to determine any specific requirements for such a form in a particular jurisdiction. 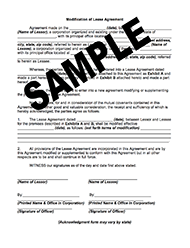 This lease clause states that the landlord and the tenant agree that the lease [sublease] is modified, and illustrates the terms and conditions of the modifications of the lease. 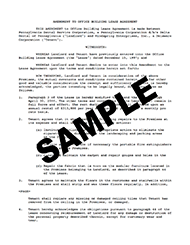 This Amendment to Lease or Rental Agreement form is used to record an agreed change to the terms of the rental agreement. Landlord and Tenant both sign the form, and the Amendment to Lease or Rental Agreement should detail what changes are being agreed upon. It is always wise to get these agreements in writing, because if it is only a spoken agreement, and there is a dispute later, the original written agreement will probably prevail over any subsequent oral agreement. 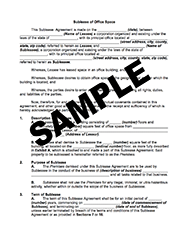 With this Amendment to Lease Package, you will find the forms that are necessary to modify the terms of a lease. The forms in this package are designed to avoid disagreements over changes to leases and stay in compliance with state law. 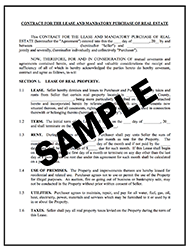 This form is a contract for a lease and a manadatory purchase of real estate. Seller demises and leases to purchaser and purchaser takes and rents from seller certain real property described in the form. Purchaser agrees not to use or permit the use of the property for an illegal purpose. An auction, fire or going out of business or bankruptcy sale, may not be conducted in the property without prior written consent of the seller. Purchaser has requested that seller enter into a contract for the lease and purchase of real estate for certain property. As an inducement to seller to enter into the contract for the lease and purchase of real estate, guarantor has agreed to personally guarantee the payment and performance of all of purchaser's obligations, conditions and covenants as set forth in the contract for the lease and purchase of real estate. 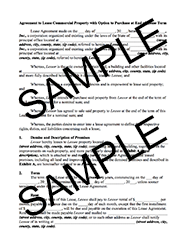 This package contains the forms that are necessary for sellers and purchasers to enter into a legally binding obligation to sell and purchase real property at the expiration of or during a lease term. 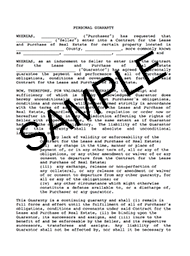 In a lease purchase agreement, a party agrees to purchase a particular piece of real property within a certain timeframe, usually at a price determined beforehand. With this package, you will find the essential forms to assist you in successfully entering into and executing a commitment to purchase or sell real property. This Application for Sublease is a potential Sub-Tenant's application to Landlord for Sub-Lease. Contains information relevant to Landlord's decision to grant or deny Sub-Lease. If granted, Sub-Tenant becomes responsible for rent and complying with terms of lease agreement. The right of a tenant to sublet largely depends upon the terms of the original lease. If the lease is silent regarding the rights of the lessee to sublease, it is generally accepted that the tenant may sublease. However, if the terms of the original lease state that the premises may not be sublet by the tenant, then of course the tenant may not. The difficult situations occur when the original lease states that the premises may be sublet subject to approval by the lessor. It is advisable that the parties state in advance under what conditions the landlord may withhold his or her consent. Otherwise, the provision will be interpreted by the courts under the standard of "reasonableness". This is a letter from a tenant to the landlord concerning the landlord's refusal to permit tenant to sublease the premises to a sub-tenant. Tenant is also informing the landlord of his/her reserving of legal rights and remedies, should the landlord continue to prevent a lease assignment. A subtenant is someone who has the right to use and occupy rental property leased by a tenant from a landlord. A subtenant has responsibilities to both the landlord and the tenant. A tenant must often get the consent of the landlord before subletting rental property to a subtenant. The tenant still remains responsible for the payment of rent to the landlord and any damages to the property caused by the subtenant, unless the landlord agrees to release the tenant from liability. Generally, to evict a roommate, you must be the original tenant (or the one who has signed a lease or rental agreement with the landlord), and the roommate you want to evict must be your landlord's subtenant. A subtenant is usually someone who is renting part of your place from you and paying rent to you instead of your landlord. In this relationship, you are the "landlord" and your roommate is your "tenant." A tenant acting in the capacity of a landlord who resides in the same rental unit with his or her subtenant may be able to evict said subtenant without just cause, as required under some local landlord-tenant laws, which vary by locality. Depending on local law, a master tenant must give written notice to the subtenant a certain number of says in advance of eviction. 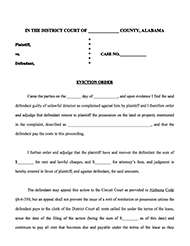 If the subtenant doesn't leave, it may be necessary to file an unlawful detainer lawsuit. Under some local laws, a tenant who subleases his or her rental unit may charge no more rent upon initial occupancy of the subtenants than that rent which the tenant is currently paying to the landlord. In other words, a master tenant cannot profit off of their landlord's property. This is a Letter from Landlord to Tenant that Sublease has been granted. Rent will be paid by sub-tenant, and the original Tenant will be released from liability for rent payments. This is a letter from Landlord to Tenant that the Sublease has been granted. Rent will be paid by sub-tenant, but Tenant remains liable for rent and damages. This is a letter from a tenant requesting permission to sub-lease the premises to the person(s) identified below in the letter. Tenant acknowledges that he/she will remain liable on the lease if the sub-lessee defaults unless the landlord decides to release the tenant from liability. A subtenant is someone who has the right to use and occupy rental property leased by a tenant from a landlord. A subtenant has responsibilities to both the landlord and the tenant. A tenant must often get the consent of the landlord before subletting rental property to a subtenant. The tenant still remains responsible for the payment of rent to the landlord and any damages to the property caused by the subtenant. Generally, to evict a roommate, you must be the original tenant (or the one who has signed a lease or rental agreement with the landlord), and the roommate you want to evict must be your landlord's subtenant. A subtenant is usually someone who is renting part of your place from you and paying rent to you instead of your landlord. In this relationship, you are the "landlord" and your roommate is your "tenant." A tenant acting in the capacity of a landlord who resides in the same rental unit with his or her subtenant may be able to evict said subtenant without just cause, as required under some local landlord-tenant laws, which vary by locality. Depending on local law, a master tenant must give written notice to the subtenant a certain number of says in advance of eviction. If the subtenant doesn't leave, it may be necessary to file an unlawful detainer lawsuit. Under some local laws, a tenant who subleases his or her rental unit may charge no more rent upon initial occupancy of the subtenants than that rent which the tenant is currently paying to the landlord. In other words, a master tenant cannot profit off of their landlord's property. An sublease is an agreement by which a lessee or tenant of rental property rents out some or all of the property to another tenant (e.g., sublessee). A sublease is a contract transferring some of the original tenant's rights to a new tenant. 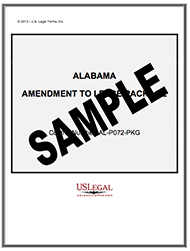 This package contains essential legal documents to help you prior to and during the process of subleasing a rental property. It contains documents that are vital for addressing legal issues that may arise between a landlord, tenant and subtenant prior to or as a result of a sublease of a particular property. 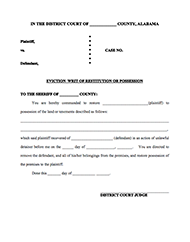 This form issued by the court after the landlord wins an unlawful detainer (eviction) lawsuit. The writ of possession is served on the tenant by the sheriff. The writ informs the tenant that the tenant must leave the rental unit by a certain time period, or the sheriff will forcibly remove the tenant. This form is an order finding the tenant guilty of unlawful detainer and demanding that possession of the property be restored to the landlord and that a specified sum of money be paid to the landlord. This form is available in Word and Wordperfect formats. 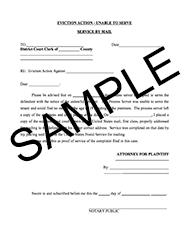 This form is used when attempts to serve a party with court documents has failed. 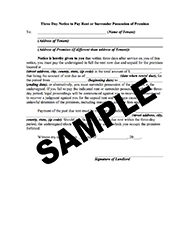 This form allows for service by publication to be granted as an acceptable form of service. This form is available in Word and Wordperfect formats. 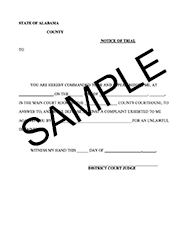 This form, Complaint - Unlawful Detainer, can be used to file a complaint against someone for an unlawful detainment. This is an official California Judicial Council form which complies with all applicable state codes and statutes. 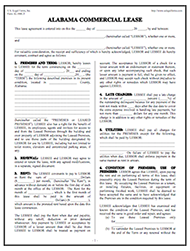 USLF updates all state forms as is required by state statutes and law. USLF control no. CA-UD-100. A forcible entry and detainer is an action that a landlord, or new property owner can take if the existing occupant refuses to leave after appropriate notice. This occupant could be either a tenant or original owner of property that was sold at a foreclosure or trustee's sale. The laws governing forcible entry and detainer actions are different if the property is residential or non-residential. The tenant/occupant must receive a written demand to vacate the property. The term of the period to vacate is dictated by the type of occupancy - whether commercial or residential and whether a tenant or a owner that was foreclosed on. This term normally is either 5 or 7 days, unless the contract states otherwise. After the 5-7 days expire and the tenant/occupant still refuse to leave then a complaint for a forcible detainer action can be filed. The statutes provide for a short notice period before a court hearing. The sole issue at the court hearing is whether or not the tenant/occupant has the right to possession. If they do not then they will be found guilty of a forcible entry and detainer. 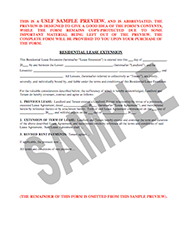 This package contains the essential state-specific forms a landlord needs to evict a tenant. If you need to get rid of an unwanted tenant, this money-saving package ensures that you follow the rules of your state. 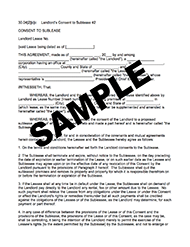 This office lease form states that the landlord and the lessee have entered into a lease where the lessee has requested the consent of the landlord to a proposed sublease. 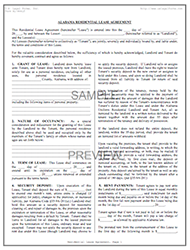 This form also lists the terms and conditions agreed upon by the landlord and the lessee. 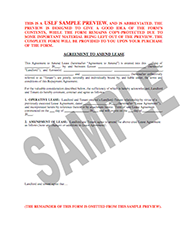 This office lease form illustrates the landlord consent in the form of a short letter from the landlord to its tenant, the sublessor. This office lease clause provides the tenant with a right of first refusal if additional space becomes available within the building. 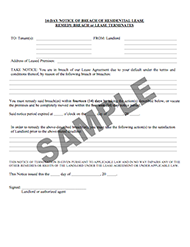 This office lease form is a supplement regarding the building operating expenses which are escalated to the tenant. 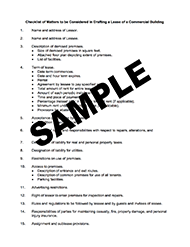 This form lists items to be excluded from the calculation of building operating costs. This form is an extension of a commercial lease for an additional term, with optional modifications and revisions. This is a notice provided by the Landlord to Tenant explaining that once the lease term has expired. Tenant has the option of vacating the premises or remaining on the premises provided that they abide by the posted rent increase. A term sheet is a bullet-point document outlining the material terms and conditions of a business agreement. After a Term Sheet has been "executed", it guides legal counsel in the preparation of a proposed final agreement. It then guides, but is not necessarily binding, as the signatories negotiate, usually with legal counsel, the final terms of their agreement. This form may be used to collect information necessary for the preparation of the most common forms of material contracts for a business. The term sheet may be used as a guide when conduct client interviews and should also be consulted during the drafting process. The items in the term sheet are also useful when reviewing contracts that may be drafted by other parties. An assignment consists of a transfer of property or some right or interest in property from one person to another. Unless an assignment is qualified in some way, it is generally considered to be a transfer of the transferor's entire interest in the interest or thing assigned. Unless there is a statute that requires that certain language be used in an assignment or that the assignment be in writing, there are really no formal requirements for an assignment. Any words which show the intent to transfer rights under a contract are sufficient to constitute an assignment. This form is a generic example that may be referred to when preparing such a form for your particular state. It is for illustrative purposes only. Local laws should be consulted to determine any specific requirements for such a form in a particular jurisdiction. A month to month tenancy (also known as a periodic tenancy) is an agreement between a landlord and a tenant to rent an apartment, house or office from one month to the next, rather than for a set period of time. Month to month tenancies can arise from the start of the relationship between the landlord and tenant, or they can also arise when the lease between the parties expires and the tenant remains in the property and the landlord continues to accept rent. This form is a generic example that may be referred to when preparing such a form for your particular state. It is for illustrative purposes only. Local laws should be consulted to determine any specific requirements for such a form in a particular jurisdiction. This is a checklist of matters to consider when drafting a lease of a commercial building. The agreement by which one party holds possession of the real property owned by another is a lease. The person who owns the real property is known as the lessor or landlord. The lessee, or tenant, is the one who occupies the property. The relationship of landlord and tenant is created by contract. To sublease means to lease or rent all or part of a leased or rented property. A sublessee is someone who has the right to use and occupy rental property leased by a lessee from a lessor. A sublessee has responsibilities to both the lessor and the lessee. A sublessee must often get the consent of the lessor before subleasing rental property to a sublessee. The lessee still remains responsible for the payment of rent to the lessor and any damages to the property caused by the sublessee. A lease agreement may contain specific provisions authorizing renewal or extension, or a subsequent agreement or modification may grant the extension or renewal. A lease agreement may also grant an option to either a lessee or a lessor to renew or extend the term of the lease agreement. 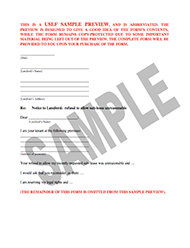 This form anticipates that there is no provision specifically authorizing renewal. 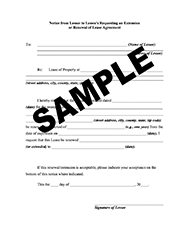 This form is a generic notice that may be referred to when preparing a notice to recover back rent or possession of the leased premises from a tenant. 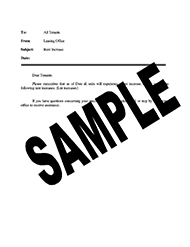 This form is a short form lease of office space for an unspecified business purpose. Lessor agrees to lease unto lessee certain property identified in the agreement. The term of the lease is one year and at the end of the primary term of the lease, it will automatically be extended for one additional year unless the lessee gives the lessor notice of its intent not to extend the term. The agreement also states that time is of the essence in the performance of all duties, obligations, and responsibilities under the term of the lease. 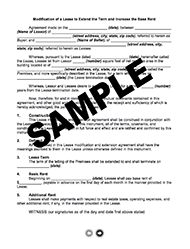 These forms are essential to anyone leasing or managing commercial real estate. Get all the forms in one package, all in Microsoft Word format so that you can customize and modify the forms as often as necessary. 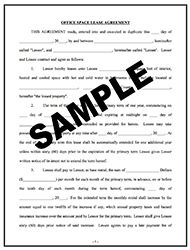 The following forms are included: Sublease Agreement, Notice from Lessor to Lessee's Requesting an Extension or Renewal of Lease Agreement, Expansion Option Clause, Office Space Lease Agreement, Notice To Tenants Announcing Rent Increase, Three Day Notice to Pay Rent or Surrender Possession of Premises, Short Form Landlord Consent Assignment of Office Lease, Landlord Consent to Sublease, Checklist of Matters to be Considered in Drafting a Lease of a Commercial Building, Assignment of Lease by Lessee with Consent of Lessor, Amended Lease - Amendment for Office Building, Commercial Lease Extension, and Building Operating Cost Addendum. Save time and money when you buy one or more of the landlord tenant legal forms from Landlord Station. Our legal documents and forms are state-specific, legally-binding, and sound. Download in PDF and Word formats. From the initial candidate screening to the eviction process, putting these forms into practice will help cover all your legal bases without taking up a lot of your time, or accumulating costly lawyer fees. You are busy enough and these forms will simplify your landlord-tenant relationships by making the navigating of real estate and property management legality easy and secure. 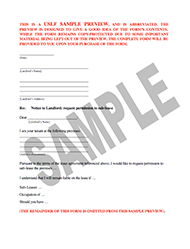 Whether you need one form or many, get the right property management forms for your rental situation instantly for a great price here at LandlordStation.com. Landlord Station's state-specific real estate documents are a more expedient and affordable alternative to drafting forms yourself, or hiring an attorney to draft them for you. Federal and state laws governing landlord-tenant relationships necessitate legal documents and forms like these by requiring written records. Your time as landlord comes at a premium and demands consolidation of certain processes whenever possible. So for your convenience, we list many of the forms you will need by state in order to run an efficient rental relationship. Our state-specific landlord tenant documents are cost-effective because we have what you need right here in one place. The information is organized in an efficient manner in order to present the material to you, your lessee, and the court effectively. Sure, you could research and write these forms yourself, but that would cost you a lot of time, not to mention money for attorney's fees for verification. 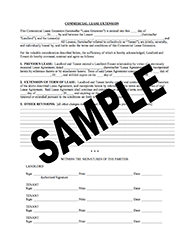 With our real estate rental legal forms, you can simply purchase the state-specific form you need, and it is immediately available for you to download and print. The legal rental forms you need as a landlord will vary from state-to-state because most rental laws governing the landlord-tenant relationship are state-specific. In most cases, it is considered smart to at least have the right legal documents to cover all aspects of your legal agreements including rental applications, salary verifications, consents for a background check, residential lease agreements, lead-based paint disclosures and more. Utilizing landlord tenant legal forms with the proper amendments and inclusions as well as having a specific form for each type of communication and/or agreement between yourself and your tenant is ideal, especially for any issues that involve state laws. For most rental cases, you can find the specific real estate legal forms you need available for purchase right here at Landlord Station. Our documents are ready for download in Word or PDF formats. This makes it easy to document your landlord-tenant relationship; having the right real estate legal forms can protect you in any situation in which the court must be involved. For instance, if you have a lessee who is behind on rent and you need to begin the eviction process, specific real estate documents can act as proof that you have abided by the law. Your written and signed lease document stating when and how much rent is owed shows that the tenant was aware of the rent amount and due date. A legal warning, or notice, of default on the residential lease document proves to the court that you gave proper notification according to your state laws. 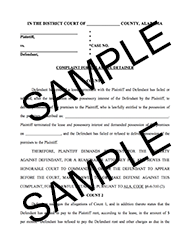 Implementing these forms and keeping them organized allows you to be prepared and have the proper evidence if a court situation is necessary. This process begins by having forms in the perfect format that are easy to use and read. We have listed these forms conveniently by state, so you can find the right ones quickly and easily. Purchase the property management forms individually on an as-needed basis, or purchase one of our unique, legal document packages. Need several related documents? Look for convenient, affordable options like the Property Management Package and the Landlord Tenant Eviction Forms Package. These packages are grouped by purpose and are sorted so that you can find the one you need quickly and easily. The packages we offer include the real estate forms you need for a particular situation and they allow for you to obtain the documents you want in one place, and at one low price. Packaged deals make it harder for you to miss an important document that should have been signed later on down the road. Once you have chosen and purchased your forms, editing them is easy. Customize fields and insert special amendments. Once the document says everything you need it to say, simply send it to all parties. You can even use LandlordStation.com document vault to save all your signed documents in one safe and secure place. Still have questions? Please do not hesitate to reach out to any of our customer service representatives to answer questions and receive assistance before and after your purchase.